It probably does no harm to have a plan; to have thought about what you would like to happen, and then, with a plan in place, to do as much as you can to make it happen. That seems to be a recipe for getting the most out of the bumpy ride that is opportunity, for making sure that what little time you have is well spent. But too much planning can get in the way of the delightful surprises and shocks that come along to mess up your day in the best and most unpredictable way. Failure to prepare has well known consequences, but over preparation turns you into a clock watching bore and a trip into a timetable. I had not planned to go to Arizona, so I thought it more necessary than usual to prepare. It was an opportunity that dropped into my lap in an otherwise work dull morning. It was a gift horse and appropriately I have no skill or interest in dentistry. Outside my office window it was early autumn, but in Arizona it would be early spring. And in spring, a young man’s mind turns to thoughts of returning migrants. Or roadrunners. Or hummingbirds. Or something. Soon my mind was spinning with the possibilities of the things I could see – I discovered that there are in fact two species of roadrunner (three if you include the Warner Brothers creation) and hundreds of species of humming birds. From this basket clutch of diversity I managed to narrow my aim down to the Greater Roadrunner and Anna’s Hummingbird. This was the shortest of short lists, but despite my best efforts to think otherwise, Arizona was a work trip not a birding expedition. I needed to keep things in perspective. Better a sip of single malt than a bottle of backyard hooch. Quality over quantity. It rapidly became clear that identifying a roadrunner would not be much of problem. This ground living cuckoo looks like very little else on Earth – the resemblance to a skinny chicken is clear and its snake chasing abilities legendary. If I saw one I was sure I would know what it was. Hummingbirds? Well that would be a horse of another colour. And colour seemed to be the fundamental problem. As far as I could tell from my rather old guidebook, hummingbirds are basically green, with long beaks and the ability to fly backwards and sideways at high speed. And they can do this whilst concealing the few distinguishing feathery marks they possess. To be fair, the book did mention differences in throat colour, but that seemed like asking people to differentiate between inevitably red Ferraris by the shape of their wheel nuts – possible in theory, but only ever achievable by fanatics (or my son!). I’ve been a birder of some sort on an off all of my life, but my ability to identify rapidly moving, often disappearing, green blurs is still rudimentary. I did not feel confident. I decided I needed professional help. I am still jet lagged and eating my plastic spoon breakfast when my phone chirps. Laurens, my guide for the day, is outside my motel in Scottsdale – about half an hour early due to light traffic and an early start. We talk over what claims to be coffee. I liberate a couple of breakfast bananas for lunch, grab the small mountain of gear I insist I need, and head for the car. Almost immediately the day list starts to grow – grackles in the car park, doves and ravens by the side of the road, and overhead an adult Bald Eagle. This last bird generates even more interest that a normal eagle sighting – a bird unusually out of place and worth noting. An American kestrel on a roadside wire. Flocks of distant dark birds, which are probably more grackles. I watch treetops and wire spreads, damp ditches and irrigation canals. I hope Laurens watches the traffic. A Great Blue Heron from a roadside pond, its wings, legs and neck tangled and splayed – once it the air it regains some semblance of order, with tucked neck and trailing legs. The slow tick tock of conversation bounces from seat to seat, as two people who have never met find a shared ground of birds seen and missed, and in the language of habitat and ecosystem. Birds of a feather, flocking together. There is no talk of earth energy or crystals. There is talk of physics and biology, of form and function, cause and effect. And eventually, inevitably, there is talk of the possibility of hummingbirds and roadrunners. Which is really talk of probability and chance. The car heads west on roads made familiar by their total newness. I recognise a few plants from the trip to Sedona and beyond. My uncertain internal compass, skewed by another change of hemisphere, spins and misses even the cardinal points. I know the sky is up and the ground is down. All else is conjecture. I feel lost. I am pulled back by conversations of home, of things I knew, of places I had been. We pull off the road and over popcorn gravel into a car park. Boyce Thompson Arboretum looks like a garden centre, with pot plants spread on wooden trestle tables, offered for sale. The compass point spins and spins. Why are we here? A charm of lesser goldfinches lifts from the car-side plants, and by the gate a Northern Cardinal, blood red and obvious, feeds on the soft berry seeds of head-high bush. The question is answered. The compass point settles. The garden beds and pathways are slightly down at heel, but clearly not unloved. Plants, some labelled, some not, drift over the edges, softening the lines of human design. Where garden beds meet at corners, damp patches, faint with moss, form. Grackles shuffle peck through the greenery, seeking food, flicking away the unwanted, the inedible. Dark feathers ripple through black and blue. Although they are a common bird, they remain undiminished by abundance. I try to get close enough to take photographs, but the corner shadows resist, placing a black bird in darkness. I take another two steps forward and immediately lose interest. A small wooden shade building sits at the meeting of three or four paths. Around the base of the building are plants heavy with brightly coloured flowers. Hanging from the roof of the building are small bird feeders, charged with a clear liquid. And surrounding both are hummingbirds. Laurens starts to name the species. Anna’s. Coasta’s. Broadbilled. Males. Females. Look left. Look right. Just look. It’s a jump-start kaleidoscope of biodiversity. Surprising in the extreme and wonderful to behold. 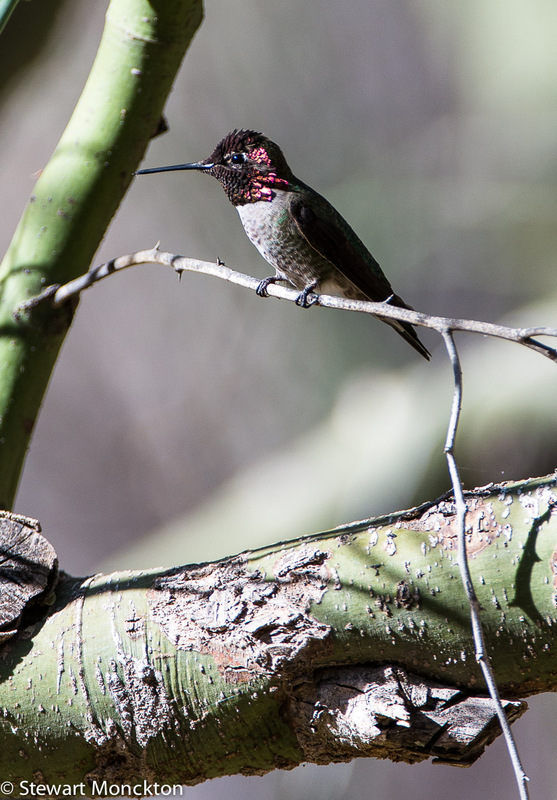 I had seen hummers the day before, but with the exception of a ten second view in Sedona, they had been tree top silhouette, robbed of colour, identifiable only by their remarkable, defining outline. These birds were alive with colour and speed. Flying jewels of emerald, with flashes of brightness at throat and tail tip. Photography was rendered almost pointless by the abundance of possibility. Where to look? What to focus on? The buzz of wings behind and to the side, a flicker of fire here and there. I did not want to see these sights as just more TV, filtered through the eye of the lens. I just wanted to watch. The sight of these birds, just a short walk from the car park, and their apparent abundance was surprising in at least two ways. Firstly it seemed too easy; as if nature had given up a gift with too little work on my behalf. Surely, such things should only be seen on mountain tops, or deep in the heart of forests, untouched by blade or sharp toothed saw. This, of course, is nonsense. Nature is not conscious of any of my efforts, the birds are here for their own purposes alone, and I am nothing more than an obstacle to easy flight. A mobile, and sometimes scary form in a landscape mapped by food plants and nest sights, with territory edges maintained by hormones, display and bright colours. The fact that their world and mine overlap is a coincidence for them and a boon for me. The second surprise runs deeper, all the way back to a flickering black and white TV in a chill house in Somerset. All the way back to a man in pale trousers and light blue shirts, speaking in hushed whispers about things I would never see. About whales, wombats and wide-open spaces, red deserts and tall mountains. About bowers and birds of paradise. And sometimes, about hummingbirds too. Such birds seemed impossibly exotic, and frail beyond belief. How could they fly as they do, migrating away from the cold of the winter, being drawn back by the longer days of spring? Even on the grey scale TV you could see the frantic energy needed to drink from hanging flowers. A high-octane lifestyle that I would surely never witness. But here they were and here I was. Enchanted. I could have stayed all day, but the birds moved on in search of sweeter pastures, and so, reluctantly, did I. And just around the corner it all started again. This time the birds seemed a little more cooperative; sitting on bush branches while I moved slowly forward, feeding on hanging flowers for more than a second at a time. Time enough to focus. Time enough to compose. Time enough to know I could put the camera to one side, and just watch. Which is what I did. We moved off to a small pool, where swallows hawked for insects. American Coots, looking less bald than the ones I am used to, proved that bad-temperedness is a family trait as they chased each other around the weedy edges of the pond. New birds kept coming – sparrows, wrens, thrashers – but the cup was already full and more became just more again as it overflowed. I kept seeing hummingbirds and the wonder never ceased. But finally, something did break through and almost top the bejewelled hummers. Walking down a path flanked with pale barked gum trees – a vision and smell of home – Laurens stopped to listen. He had his head tipped to one side, in a pose that favoured sound over sight. I could hear nothing different, but then my ears were full of unfamiliar sounds. The familiarity of the trees clashed with the alien soundscape, and I had no idea where to look or what to listen for. The trees formed a skeleton of familiarity, but the sensory cloth that hung from it was unknown. With the still head and fast hands of a well practiced watcher Laurens lifted his binoculars to his eyes. “There! Vermillion Flycatcher”. Following his eye line into the treetops there it was. A patch of pure, blood red colour. Even when I could see in the field of my own binoculars, and watch its beak open and close, I had difficulty linking the movement to its call. Photography was next to impossible, too high, too distant, too small. But the view through the glasses was stunning. I could but hope that a female unseen in the trees appreciated the show as much as I did. This was, for me, an unexpected bird, a treat bird, a bird unlooked for. On the way back to the car park it dawned on me that we had not seen any Roadrunners. Was I disappointed? – well, yes. But did it concern me? – not really. On a day of emeralds and rubies, it would have been greedy to ask for more. Beautiful shots! I have never seen an Anna's Hummingbird in person, but I do get quite a few Ruby Throated Hummers in my yard. I love to watch them and occasionally they will buzz my head trying to get to my feeder. Wonderful post, my hummers don't stay still enough for shots like yours with my little old camera. Good shots. Oh wow Stewart, what a treat! So glad you got to see those jewels! Marvellous captures too! Stewart .. This is so reminiscent of my once only birding visit to the USA. A probable list as long or longer than both arms. New sights and sounds bombarding the brain AND I also failed to see a Roadrunner! Well, it's called 'birdwatching' not 'birdhunting' or 'birdchasing' and that's the beauty of it; you wait and you watch. Mind you if I were in Arizona I'd be pursuing those hummers! 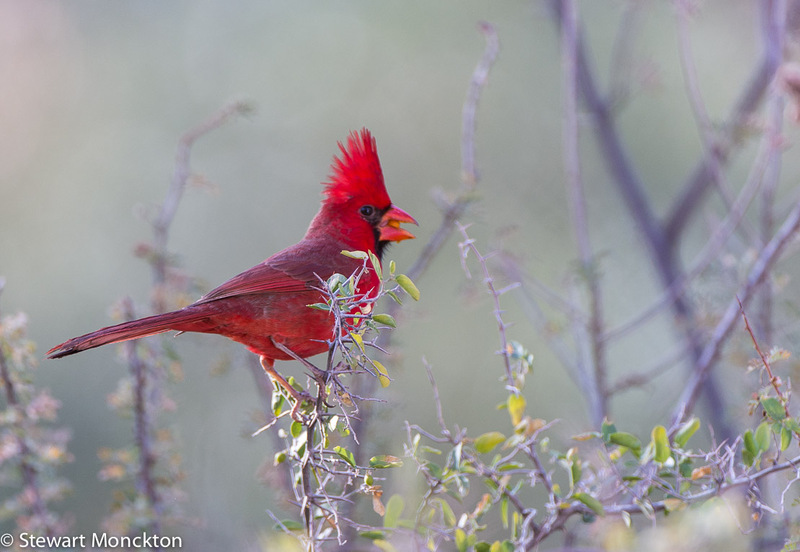 I grew up in South Florida and Cardinals were a common sight in my backyard as I was growing up. I haven't seen one in years. Hummingbirds are always delightful. Great photos. I think if I had to name an absolute favorite bird, it would have to be the hummingbird. I don't see the often at all, but when I do it's always a treat and it makes me feel like a child inside for some reason. Oh, Stewart, how delightful! You know, I didn't realize there are no hummers in the Eastern hemisphere...something I had just never thought about. I assumed everyone had some sort of hummingbird to love, I guess. In Eastern U.S. the ruby throat predominates, and depending on where you live, is seasonal. In the West and the Gulf coastal areas, it is a much different story, and I have come to really appreciate the bounty afforded to us here! 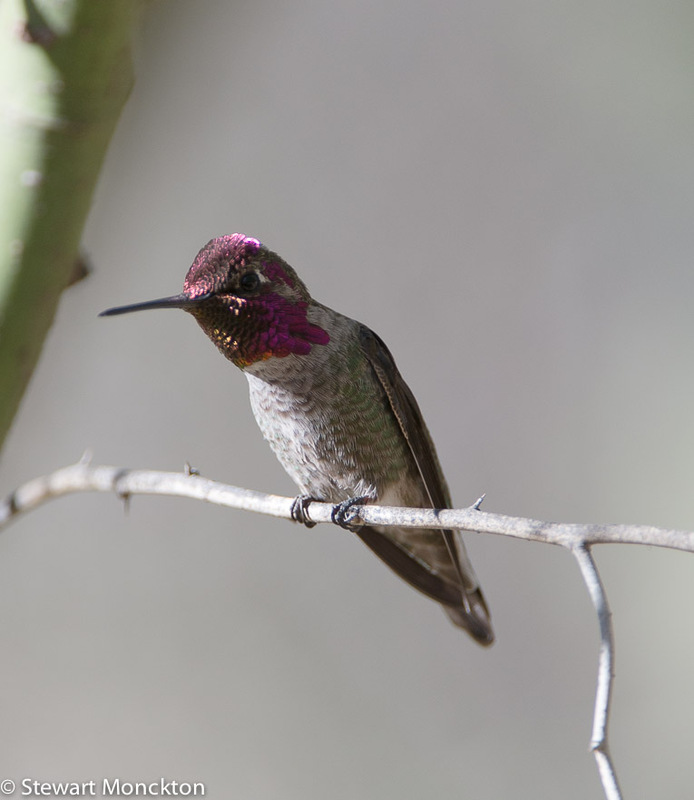 Hummers was one reason we chose to go to Madera canyon instead of doing something quite different for our anniversary. I, like you, need help with identification, though. With any kind of bird watching, I have always been a little at a loss to know what I am looking at! 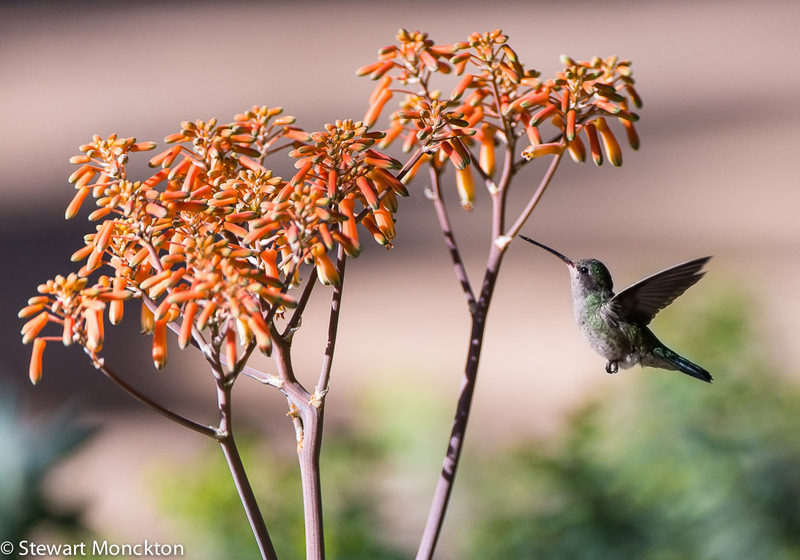 But especially so with hummingbirds, so when our host at the Inn offered some help in that regard, I was very grateful. They are like jewels...perfect priceless gifts! I couldn't agree more! And though I wish you had also gotten to see a roadrunner, I'm glad you saw so many different bird species, and got to enjoy the hummers so completely! And your photos are GORGEOUS!!!! Gorgeous photos, wonderful words. Brought back lovely memories of elusive hummingbirds in my garden in Minneapolis. So small I thought they were large moths at first. I don't know one hummingbird from another and if I saw a road runner, it would have to look like the Warner Bros version for me to know it!!! 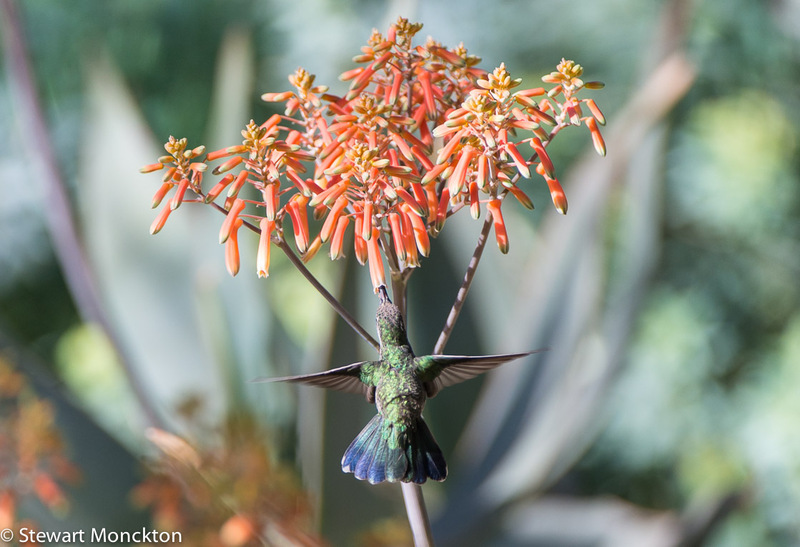 Great post...love that you were able to capture those little hummers at rest!!! And such a beautiful cardinal...didn't know they were in Arizona!!! Hope your Arizona visit was fulfilling!!! Haven't seen any hummers in our area yet. But i'm sure they're out there. I'll occasionally spot them out of the corner of my eye as I'm hiking along the C&O Canal. How fun, to "see" the hummers through your eyes. I only get them migrating in spring and fall and only one species, but it's a treat every year nevertheless. I love seeing Vermilion Flycatchers and Hummingbirds. If you ever return on purpose with more time and find yourself at Big Bend National Park, you should see many Roadrunners.